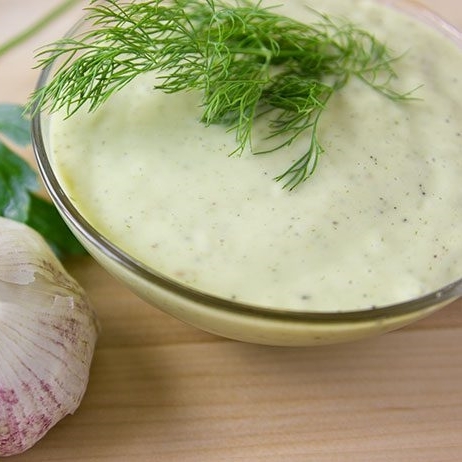 Use this creamy garlic dressing for salads or as a dip for a vegetable tray. This is made with non-fat yogurt so is low in fats and WW Points. On the new Weight Watchers FreeStyle plan, non-fat plain yogurt is a zero point food item, so you can have the creamy flavor without adding up your points for the day. Even if you are not a member, this healthy salad dressing will save you on calories and fats so that you can stick to your diet without over doing it on the dressing. You can use this dressing with a healthy summertime salad with grilled chicken for a light lunch or dinner appetizer. 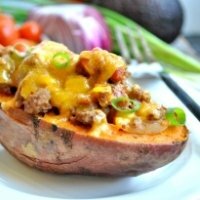 For this recipe (and all recipes on this site) you will find nutrition information and the Weight Watchers points values including the new SmartPoints (Freestyle and non-Freestyle) and the older plus and original plans. Combine yogurt, milk and lemon juice in a small bowl. Add garlic and oregano and stir to blend. Add salt and pepper to taste, blending one last time. The plain non-fat yogurt was not used when calculating the Freestyle SmartPoints. If you want just a hint of sweetness to this creamy garlic dressing, add a teaspoon of honey to the recipe. 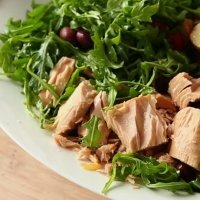 This tossed salad uses tuna to give it protein and flavor. It includes a recipe for Lemon French Dressing. The layers in this salad include chicken breast, veggies, cheeses and non fat Miracle Whip making it a healthy idea for your get togethers. 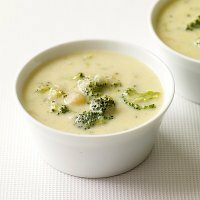 Pair your salads with this creamy soup turning your starters into a light combo lunch or dinner. 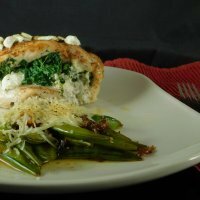 This stuffed chicken breast is one of my favs. With the bold flavor of goat cheese, this will wake up your taste buds. 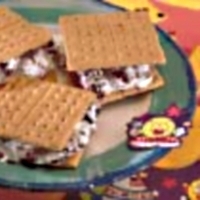 Who says you need a campfire for S'mores! Use your microwave to combine the sweet with tart in this dessert recipe. Add a hearty appetizer with your salad and skip the main course. 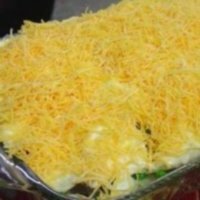 This potato boat recipe is packed with flavor. Here's a blue cheese dressing that I found (and am going to try as I love blue cheese. It has only 1 SmartPoint for 2 tablespoons. Eating salads always seems healthy. But not all salads are made with the right stuff. Find out if your salad is made with the right stuff. Use these tips for making healthier selections so you can lose weight and feel great. Getting in your fruits and veggies are important. But don't just drink them, eat them. Learn why here.